Candy Ride colt ran fast fractions on the front end and humbled a classy group late. Gun Runner seemingly had everything working against him. Winchell Thoroughbreds and Three Chimneys Farm’s 4-year-old Candy Ride colt hadn’t won at 1 1/4 miles yet. He got no breaks with a hot pace and Collected pressing him all the way. He worked against what appeared to be a bias against inside runners on the main track during Breeders’ Cup weekend. Gun Runner took it all and put everyone away in the $6 million Breeders’ Cup Classic (G1) Nov. 4. In the final furlong he humbled a field full of class. Collected, who hounded the front-running Gun Runner all the way around the Del Mar oval, gamely held second, but was no match late and 2 1/4 lengths behind at the wire. West Coast finished an even third, another 1 1/4 lengths back, and War Story came in fourth. “We let Gun Runner be who he is,” said winning trainer Steve Asmussen. “I think the amount of success we’ve had with him ever since we quit worrying about who he was in with or where they were going to be—he’s let them adjust around him. … The year that this horse has put together is a little hard to top. After a clean break from post 5, the fractions Gun Runner put up on the infield tote board more resembled a sprint than a 10-furlong test. They were even faster than the previous day’s Las Vegas Dirt Mile (G1)—set by the speedy Sharp Azteca—through six furlongs. The first quarter-mile went in :22.50, the half-mile came in :46.31, and six furlongs popped in 1:10.50. But it was on a loose rein from jockey Florent Geroux. He never let Gun Runner get more than a length away early, but $1 Million TVG Pacific Classic Stakes (G1) winner Collected went on the attack midway through the final turn under jockey Martin Garcia. At the quarter pole the two were head-and-head, as West Coast and War Story were under a drive to keep up, but couldn’t make up any ground. Collected’s challenge was answered at the top of the stretch as Gun Runner began to kick away again. At the furlong pole the margin was a length and he extended it to the wire to complete the distance 2:01.29. Favored Arrogate, in the final start of his career, finished in a dead-heat for fifth with Gunnevera, after the 2-1 choice ducked in from the inside post and never really got involved. 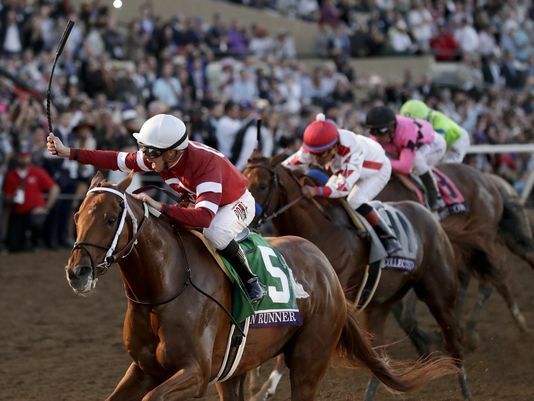 In eighth through the stretch the first time under jockey Mike Smith, his Hall of Fame rider asked the colt who handed Gun Runner his only loss of the year in the Dubai World Cup Sponsored By Emirates Airline (G1) to keep up, but Arrogate dropped back to 10th in the backstretch. The four-time grade/group 1 winner passed tiring horses five-wide in the final turn, but lacked any type of threatening late kick in the stretch. Smith pointed to Arrogate’s dislike of the Del Mar main track to explain why his mount didn’t fire. He finished a far-back fourth in the TVG San Diego Handicap (G2) and came in second behind Collected in the Pacific Classic over the summer at the seaside racetrack. “He just doesn’t like this track,” Smith said. “For whatever reason—I hate to say it—he has shown it time and time again, and showed it today. (His bad start) is what he’s been doing every time he runs here. When he’s on his ‘A’ race, he’s one of the fastest horses we’ve ever seen. He just won’t run over here. Churchill came in seventh, and was followed by Mubtaahij, War Decree, Pavel, and Win the Space, to complete the order of finish. Since his return from Dubai, Gun Runner has four straight grade 1 wins—the Stephen Foster Handicap, Whitney Stakes, Woodward Stakes Presented by NYRA Bets, and the Classic—while Arrogate went winless in three starts. Gun Runner, who was bred in Kentucky by Besilu Stables out of the Giant’s Causeway mare Quiet Giant, now has an 11-3-2 record from 18 starts and $8,988,500 in earnings.